Please refer to our stock # 3539 when inquiring. This large Japanese late Meiji (1867~1911) ivory carving is 14 ¼” high, 4” wide and 2 ¾” in depth. 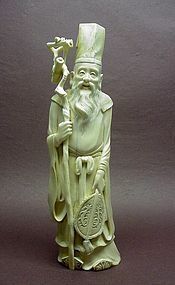 It depicts a smiling sage carrying a fan in his left hand and holding a long staff in his right hand. A rolled up scroll is tied to the top of the staff. Aside from a few hair line cracks due to age and size, it is in good condition. More detailed photos are available.